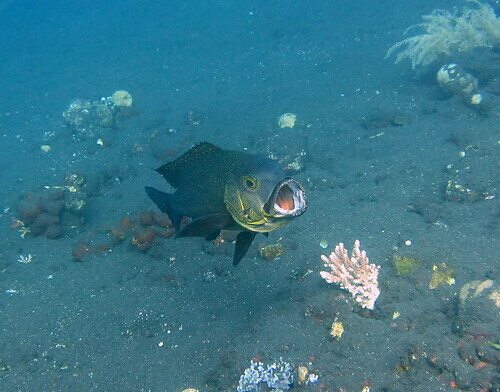 scuba | eat. drink. cook. travel. 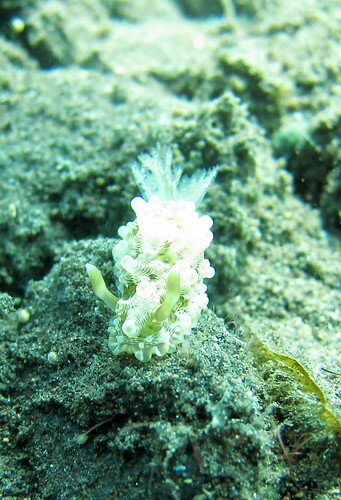 And we conclude this series on Tulamben with a tribute to the nudibranch. 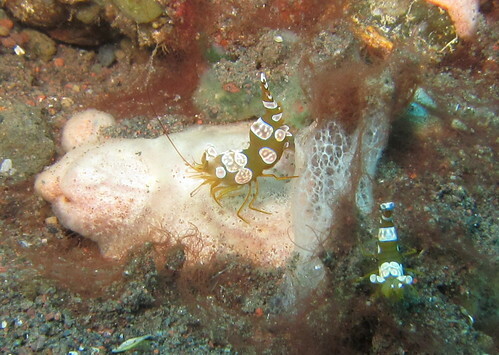 There was no shortage of them at Tulamben, we even saw their ribbon-like masses of eggs occasionally. … to those that looked like bits of bubblegum. There were a few that came in pairs, exhibiting the trailing behaviour of one hanging on to the tail of the other in making contact. There were others that made head-to-head contact, so I wonder whether it was a precursor to any mating action. In any case, these fellas move so slowly I’ll probably have run out of air before anything happened, so it was just as well that I moved on. 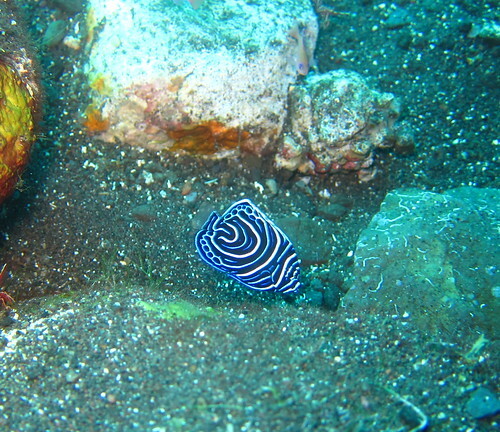 We were pleased to have spotted a nudibranch that Wayan had never seen before. 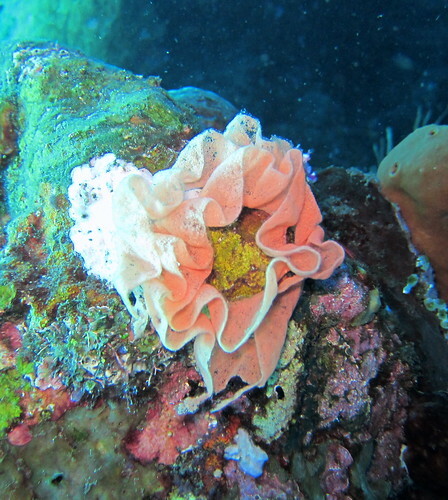 This warty fellow seems rather well placed to camouflage itself amongst the coral and sand, it’s no surprise it’d not been seen before. I’m sure Wayan will start looking out for it more from now on, and perhaps it could end up being a new species named after him! 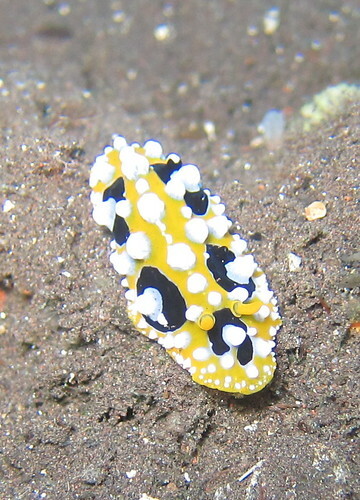 Other nudibranchs were more quotidian, like this yellow, white and black one, looking quite like most of the ones we see while diving in waters nearer to home. 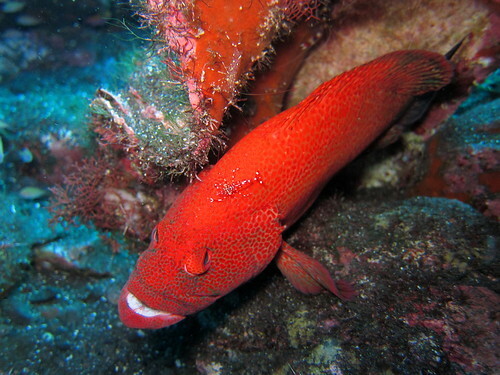 Some were unusual for me, like this red one. 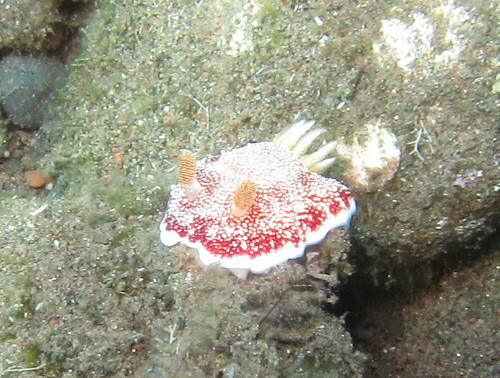 I’ve not seen a red nudibranch before, I don’t think. 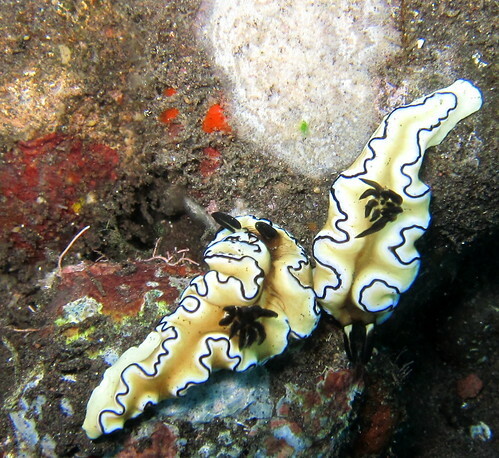 And others, like this, made me torn between liking them for their delicate contours and cute colouring, and turning away in disgust because the yellow splotches made me think it had a skin disease. 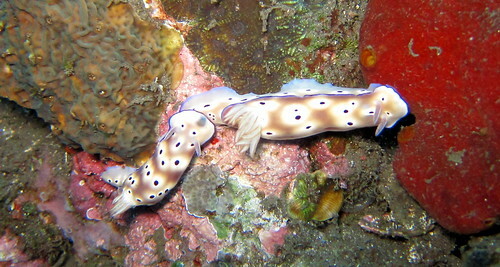 Whatever the case, nudibranchs reminded me that slowing down helps you to get good shots on the camera, and that slowly but surely does it, just like how this one ended up where it was. And that was the end of our sojourn to Tulamben in Bali. 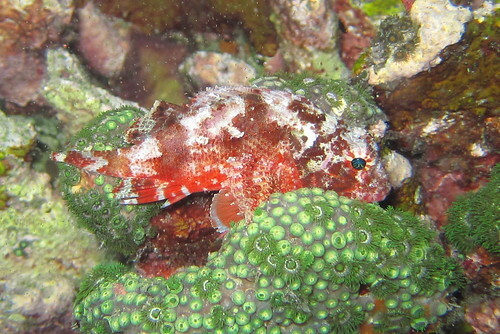 I have a very soft spot for the little creatures and DC was constantly waiting about for me to finish lying in wait for one small creature or another to emerge or stay still enough to photograph, such as this hawkfish. 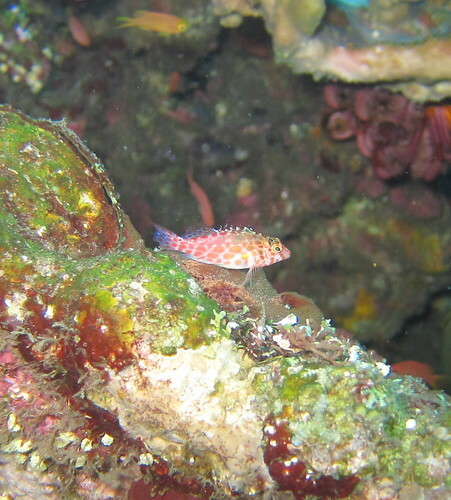 I was very happy to see quite a few hawkfish there, like this pixy hawkfish with the tasseled dorsal fins. 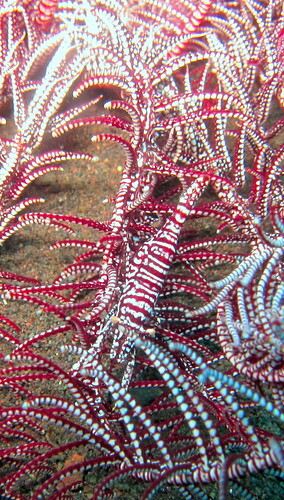 Then there were the ornate ghost pipefish. 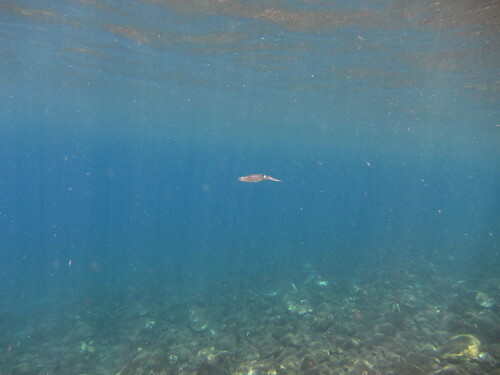 It’s normally quite a rare fish to spot, but we saw plenty here. This one is fairly young, as can be seen from its wispy tail. Then we got some nice young adult specimens like this. And finally some of the older, darker coloured ones that looked less delicate than the younger fellas. 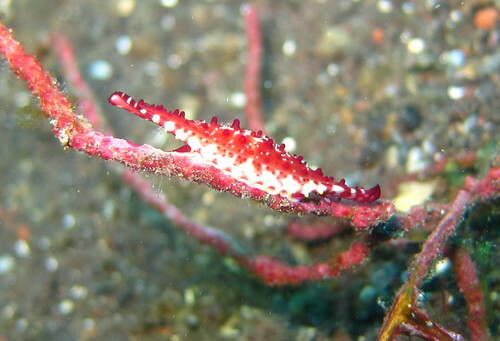 We also found some of its close cousins, the robust ghost pipefish. 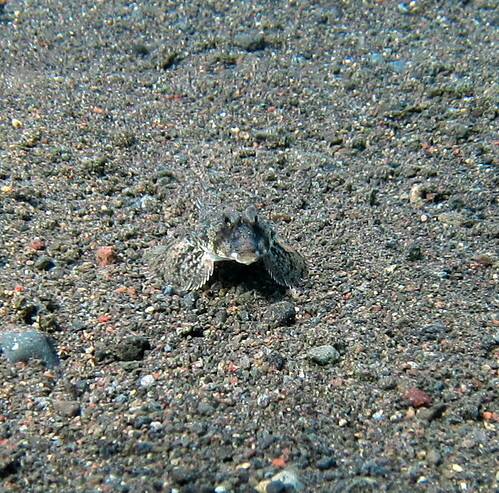 They were well camouflaged, looking like brown leaves floating just above the sandy bottom. 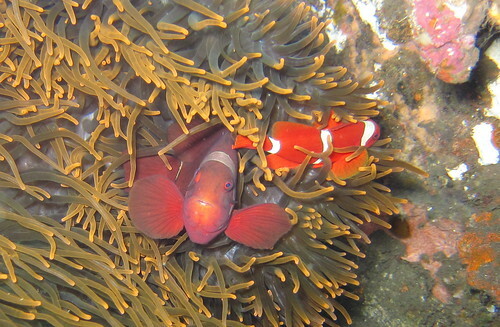 Another of my favourites is the pink anemonefish. Here, one shyly looks up as another dodges away from the camera. 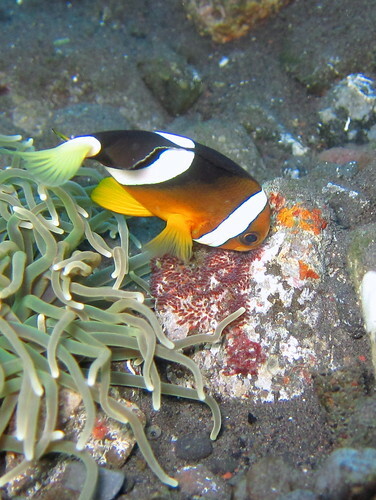 I don’t know how rare these spine-cheek anemonefish are, but I was delighted to find them as I’d never seen them outside of the fish books before. Check out the weird spine jutting out from its cheek! 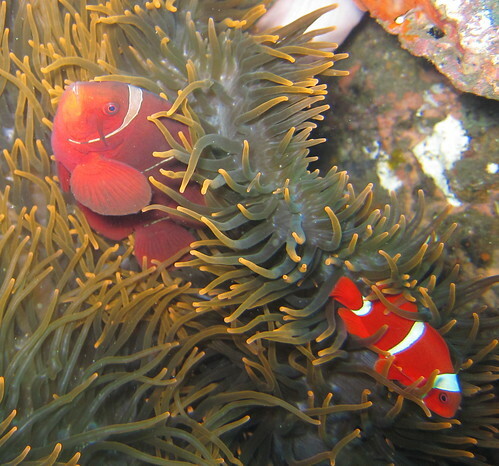 Other anemonefish had eggs! 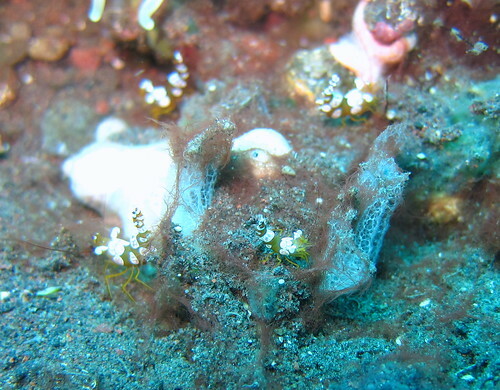 This is really rare anywhere else, but every trip to Tulamben I’ve seen fish eggs. 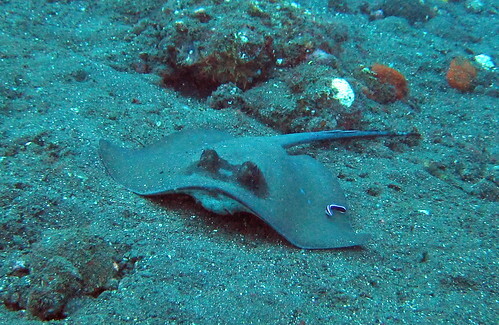 Have I told you yet how much I love diving at Tulamben? It was really sweet to see how the parent tended the eggs so carefully. 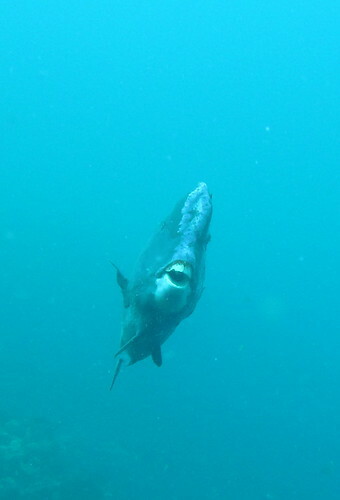 There were other fish with eggs too, like this sergeant major fish. I think it was really cool how the eggs are purple. 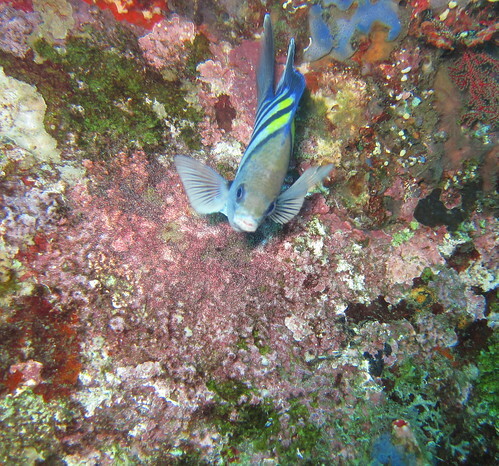 This fish had laid its eggs on the walls of the wreck, and we ascended to an entire expanse of sergeant majors guarding their own eggs. A wonderful sight. 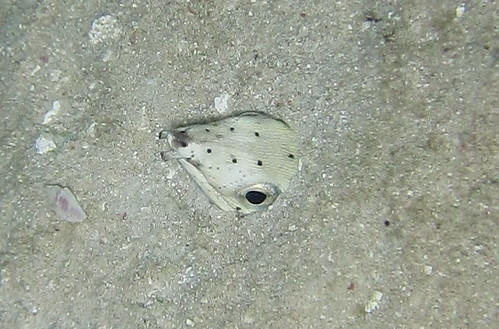 Then there were the juvenile fish, like this baby emperor angelfish. I like how striking it is, looking like a kid got a white marker and drew circles on the fish. 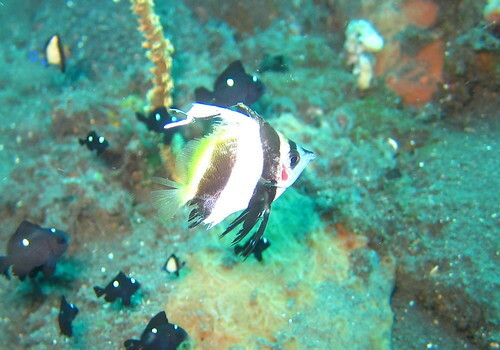 Other juvenile fish were less pristine, like this bannerfish that made it out of a bigger fish’s jaws just in the nick of time. Poor guy. 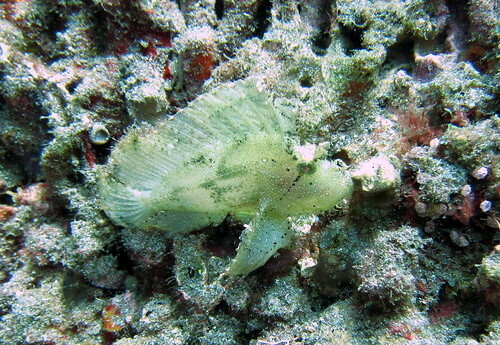 Of course other juveniles do much better, like this batfish, looking much more elongated than its adult self. 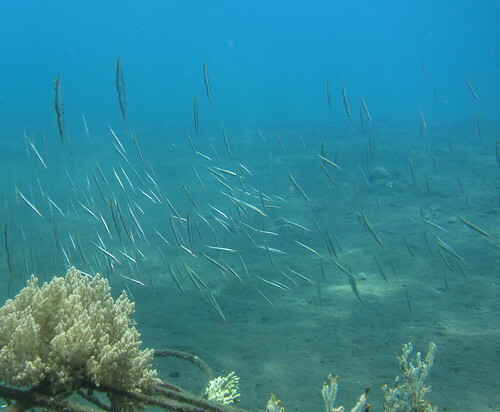 There were other fish that remained small even as they reached adulthood. 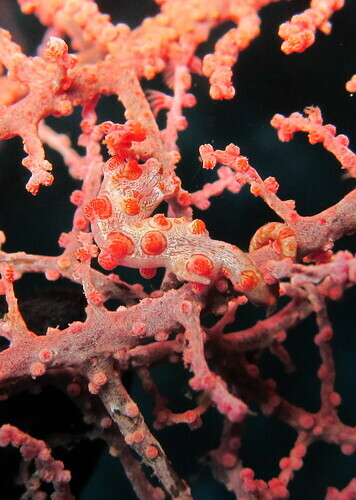 One of them is a superstar of the diving world – the pygmy seahorse. It was almost impossible to get good shots of this shy creature half the size of a fingernail, especially when it turned its back to the camera and resolutely looked away. 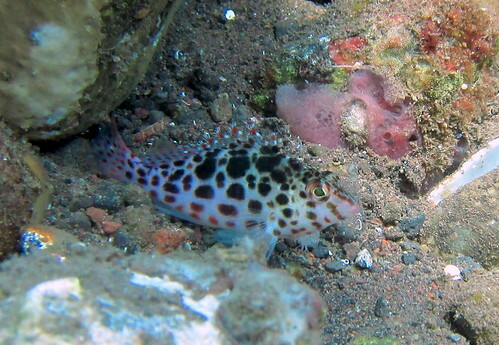 Still, no trip to Tulamben would be complete without a couple of pictures of these, imperfect or not. 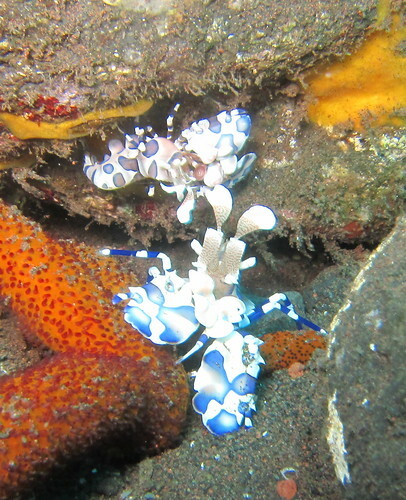 There were a whole load of crustaceans around in Tulamben. 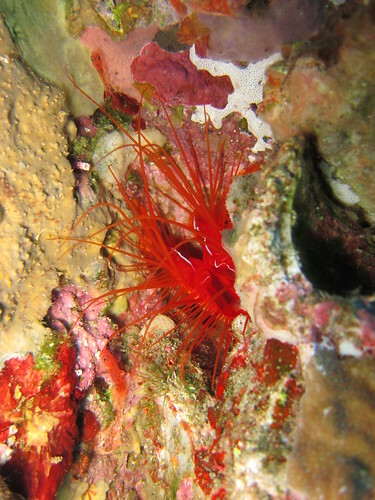 Considering that we hardly did any night dives, which is when they typically come out to play, it is again a testament to the great diving at Tulamben that we saw so manyof them. 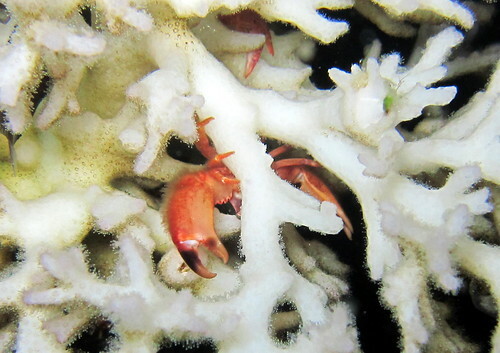 Here’s a brightly coloured coral crab under its anemone house. 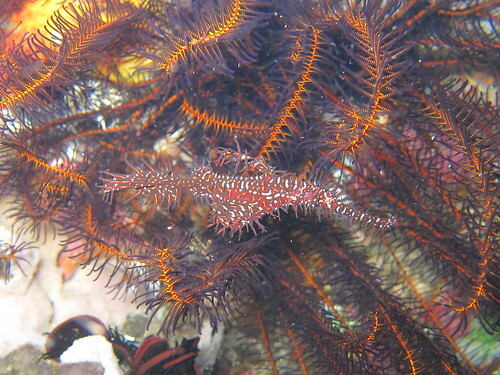 It’s a wonder it doesn’t get eaten that easily, its colour is so vivid. 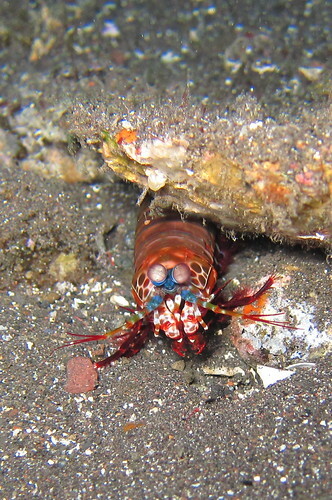 Even more brightly coloured were the peacock mantis shrimp, its inquisitive eyes jutting out quizzically. 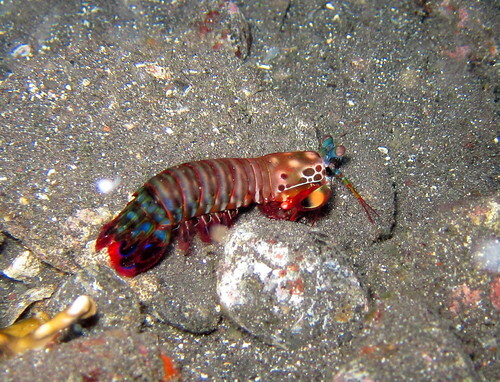 It’s when the mantis shrimp is in side profile that one understands why it’s called that, for its tail has the pretty colours of a peacock. 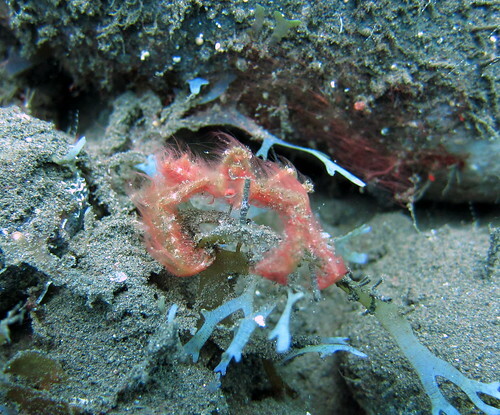 We revisited startling specimens such as this orang utan crab, something you wouldn’t typically expect of something underwater, let along a crab. It’s almost impossible to bring one of these into sharp focus, as it’s so hard to tell whether the fuzz is caught sharply or not. 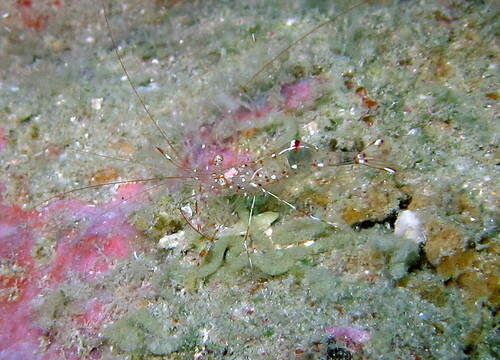 There were also plenty of shrimp, like this imperial shrimp. It’s amazing how transparent its body is. I guess the transparency is how it camouflages itself, especially when young. Check out how the young one is so much harder to spot than the full-size one. 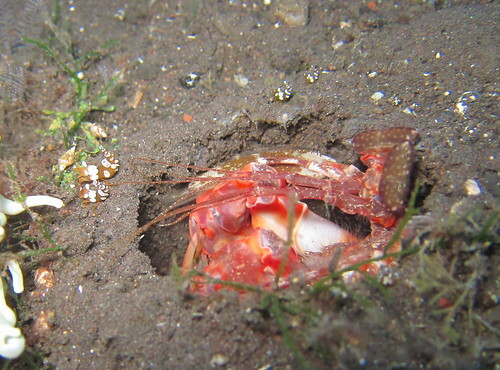 There’s another type of mantis shrimp, the smashing mantis shrimp that hides in its hole waiting for unsuspecting prey to go past. 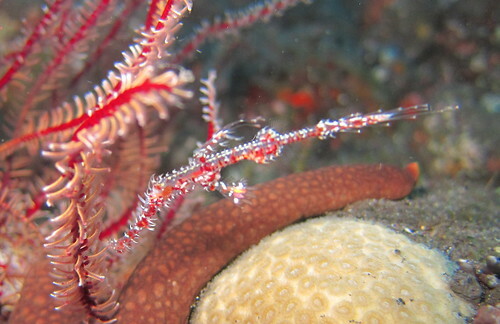 Here, I admire the bravery of these hingeback shrimp. 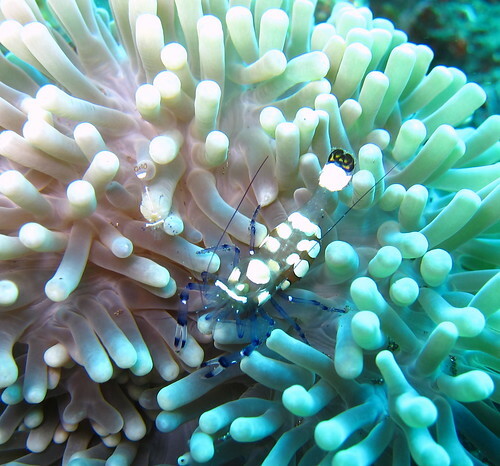 They’re so close to the smashing mantis shrimp’s home that it’s impossible for the bigger one to catch the smaller ones. Nothing like being too close for comfort here! 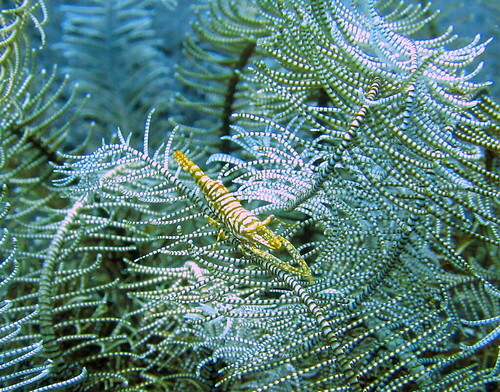 Then again, these little shrimp are so tiny it’s hard to see how they’d make a dent in any sizeable creature’s stomach. Still, they are very pretty and it’s fun to get in close to catch a good shot of this attractive orange shrimp. 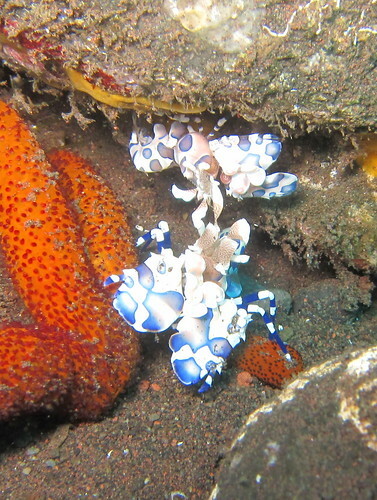 One of my favourites, as regular readers would know, is the harlequin shrimp and again Tulamben didn’t disappoint. We saw this adorable pair posing as orchids. It’s really cute how they strutted and posed about. … and the red one here. It’s hard to believe how sharp Wayan’s eyes were in spotting these. 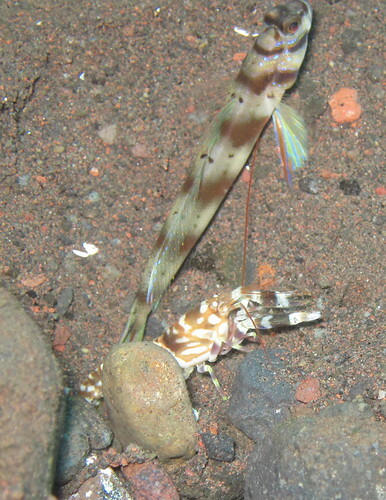 Easier to spot but much harder to spot were the goby shrimp, who spent their days pushing sand out of burrows guarded by gobies. 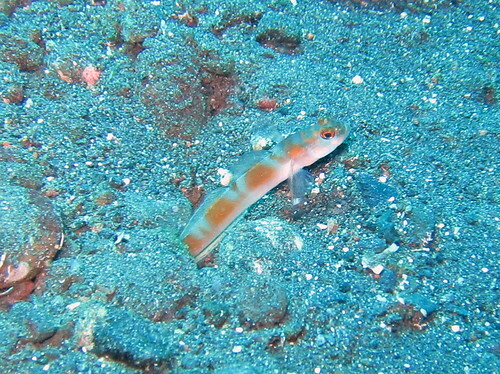 At any movement at all, the goby would dart back into the hole, and of course the shrimp would dart in at the first twitch of the goby’s tail. 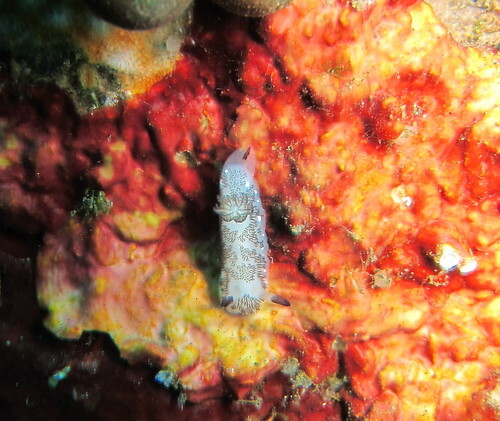 Last of all in this series of crustaceans is this shell of sorts. I have no idea what it is. If anyone can identify it, I’d be really grateful. 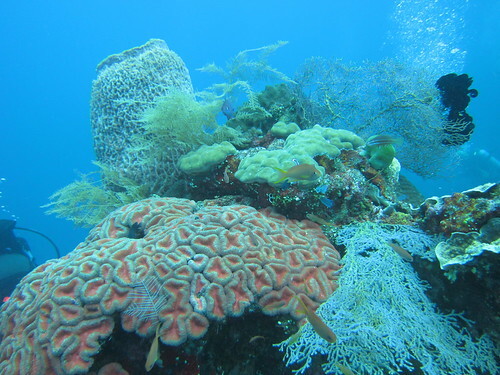 There were lots of creatures living on the bottom, whether on the bottom of a part of the wreck or on the sea floor proper. 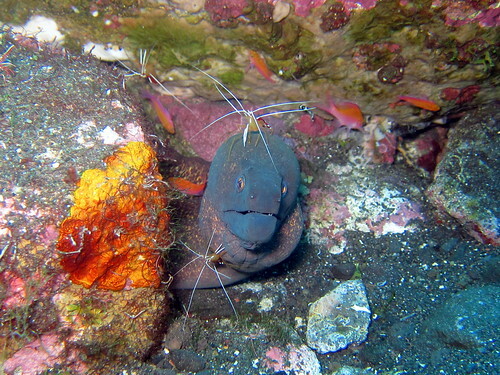 One of them was the relatively hard-to-spot snowflake moray eel with its startled expression. … and this black juvenile. 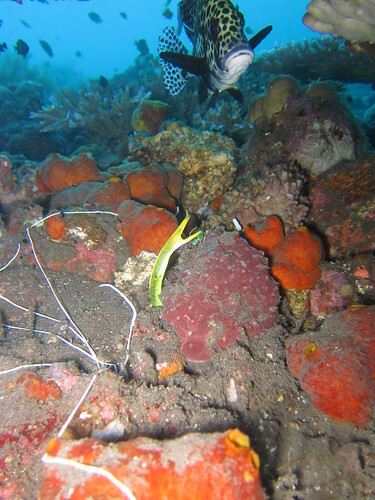 Ribbon eels have a characteristic way of moving in and out of their holes, probably partly moving with the surge and partly to act like a lure for its prey. 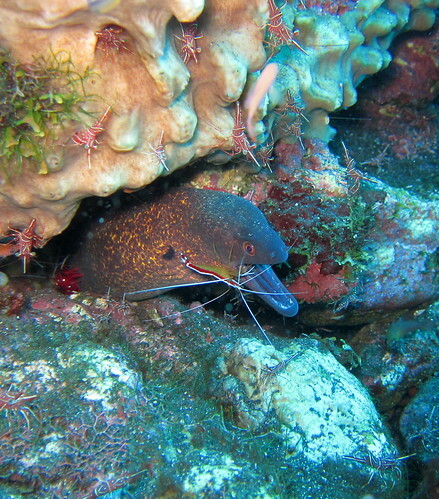 Yet other eels we saw were the incredibly shy garden eels. It was impossible to get any closer without chasing them back into their holes. 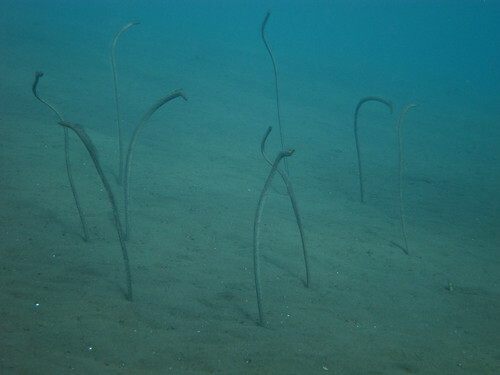 I think these are spotted garden eels, but it’s difficult to tell without a close up picture. 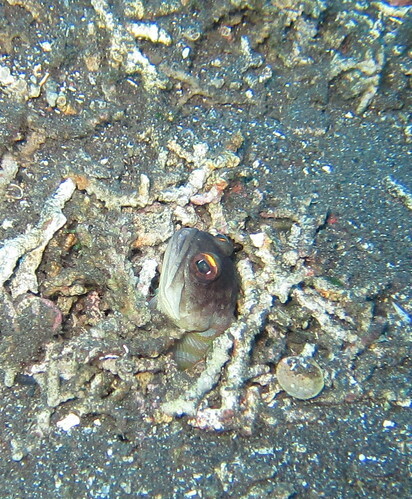 … and this yellowbarred jawfish with its characteristic yellow mark on its eye. 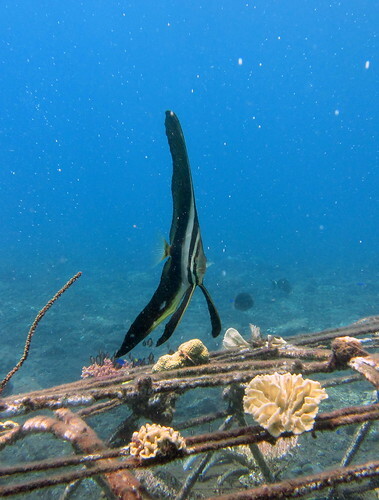 Then there were the fish that simply sat on the bottom, never being found more than a few centimetres off the coral. 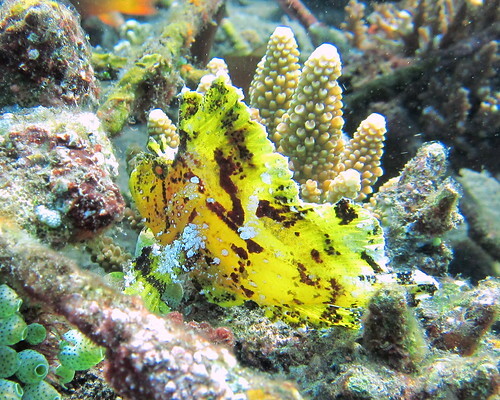 Case in point is the leaf scorpionfish. … and a red variation. 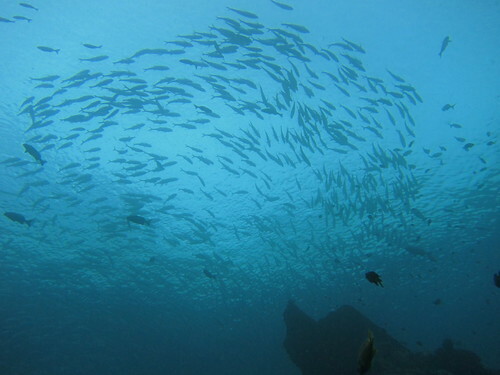 Such was the multitude of fish at Tulamben, it was a fish photo collector’s paradise. 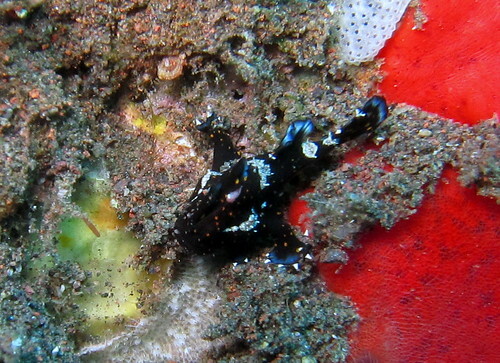 We were also lucky to find a rather hard to find ocellated frogfish. This tiny fella was about an inch or so long and we find him while battling a unexpected strong current. Too bad we weren’t able to stay for too long as I’d certainly like to get a better shot of him. 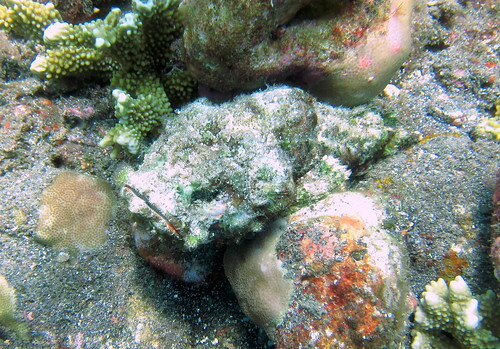 And last of all was this deeply depressing stonefish. It’s almost perfectly camouflaged, with only its glum downturned mouth to give itself away. 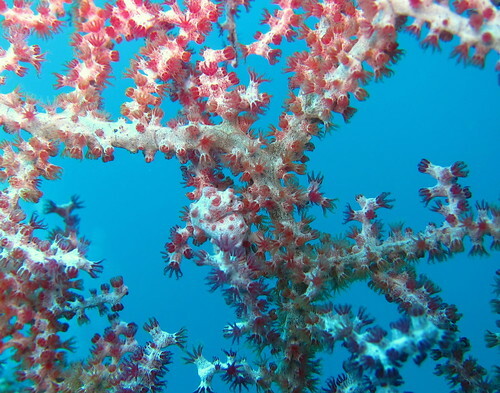 There was plenty of very healthy coral in Tulamben as usual. And there was occasionally very blue and clear water. 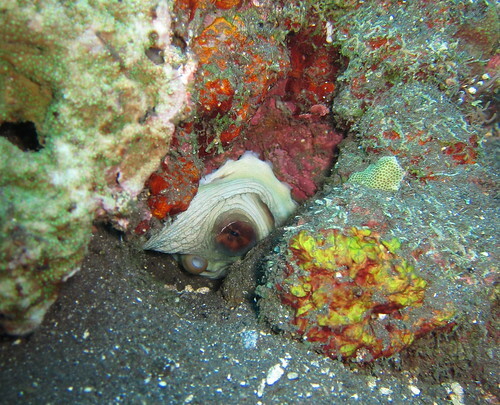 … and were even luckier to discover an electric clam in a crevice on one of the walls of the wreck. 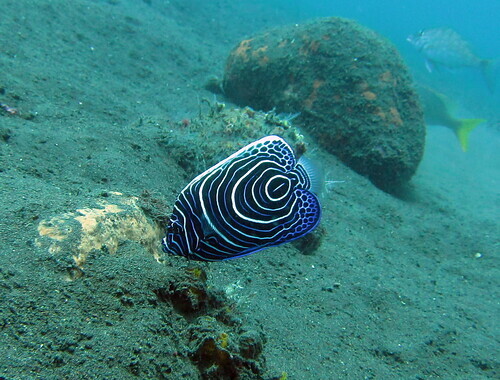 Check out the blue-white lines on the clam – those are the electric bits. I wouldn’t advise putting a finger anywhere close! 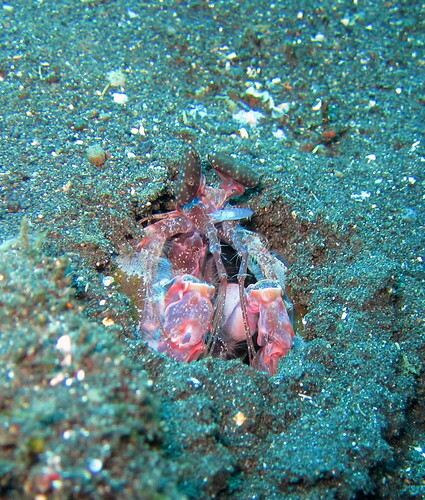 Other things in crevices included this octopus that didn’t make any attempt to conceal itself. All it did was to curl its bulbous head in a bit more to look like a giant, doleful nose. Another one was far less gregarious. I wouldn’t call this one shy, given its evil eye peering malevolently from its hole. Cleaning stations had plenty of crevices too. 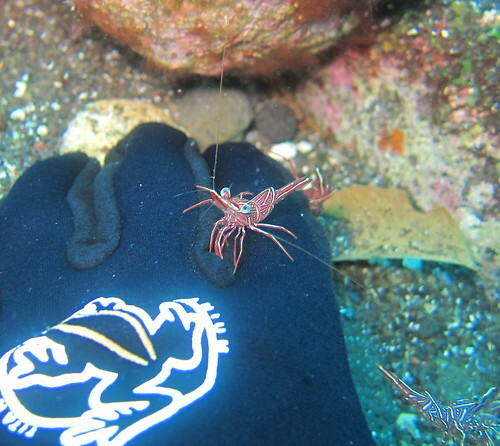 Here, many different types of shrimp were proffering their services, including this one coming right up to my hand. It tried to give my glove a good clean, but in vain. 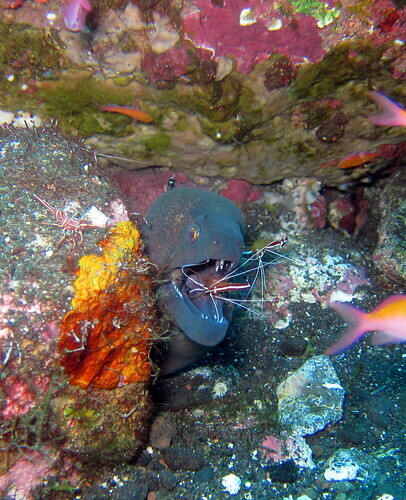 Others had more business with this giant moray eel, giving it a good dental check up. 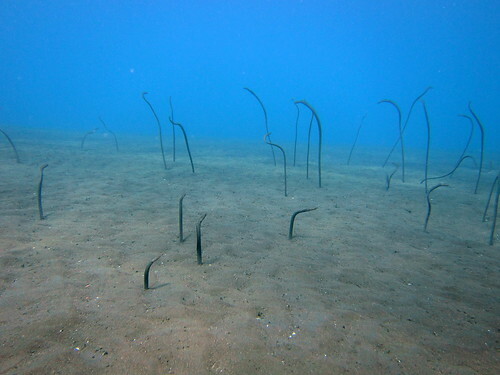 Some were so zealous about their job that they went into the jaws of the eel quite fearlessly. 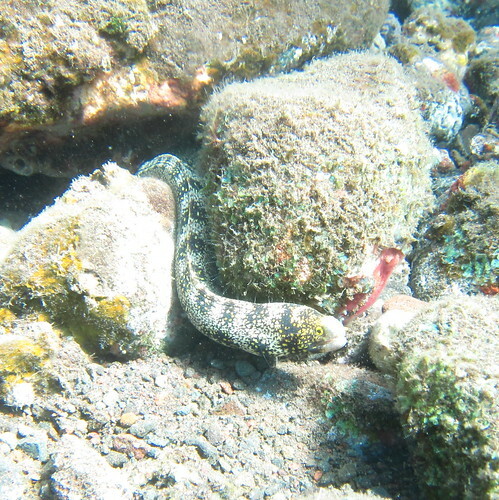 And the eel never bothered trying to eat it. 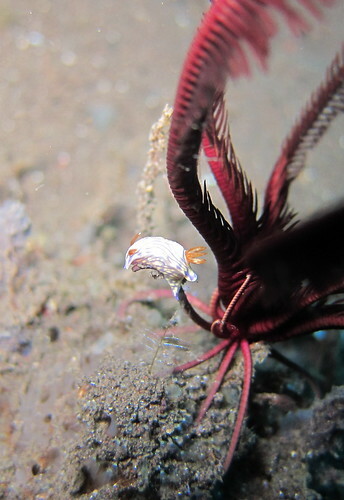 The shrimp obviously had to be quite smart in getting out before the eel’s jaw closed, just like this one making the eel look rather foolish. 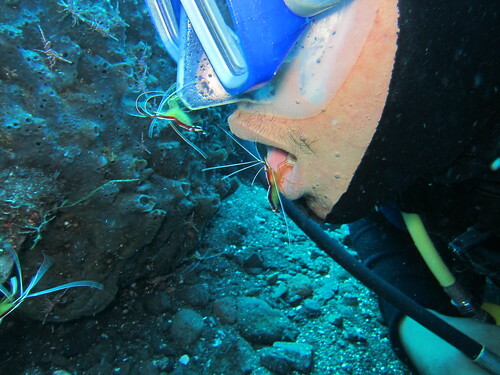 Wayan did a reprise of the last trip and demonstrated how the shrimp would even go into his mouth with sufficient coaxing. Here’s an incredible action shot of not one but two (!) shrimp making a beeline for his lunch leftovers. And here they are making sure they’re doing a thorough job. Wayan kept at this till he could hold his breath no longer. The show was over and we went on to the next cleaning station. 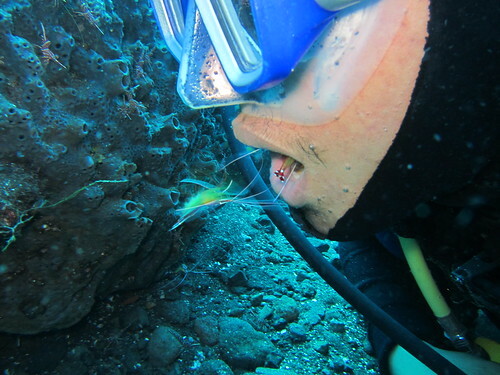 Here, a shrimp took a breather atop a coral grouper’s head before going back into its mouth for more dental action. And a midnight snapper waits its turn, mouth open in anticipation of the cleaning to come. 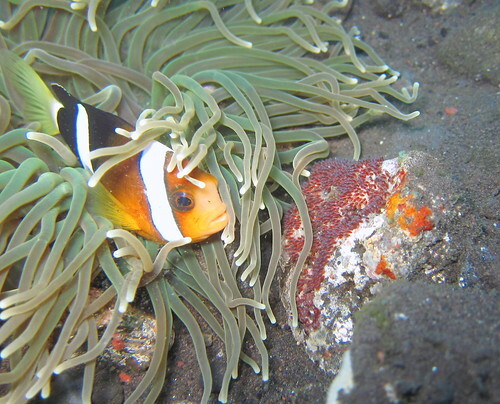 I’d greatly enjoyed my last trip diving in Bali and I knew DC would love it as much as I did. 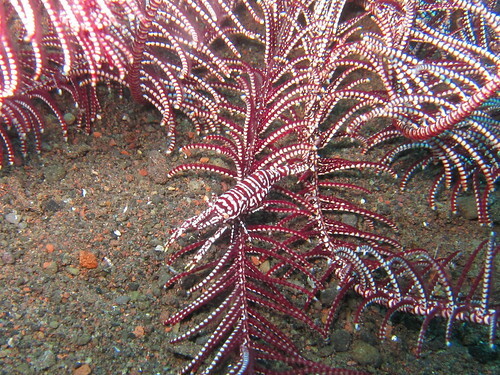 It was a no-brainer to choose Tulamben and Tulamben Wreck Divers. 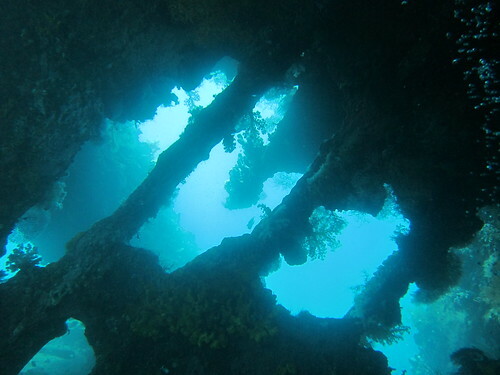 Tulamben has the fabulous Liberty wreck and other fantastic dive sites that are just off the beach (hence no long boat rides and the chance to return to the room for an afternoon nap), and TWD has excellent guides like the eagle-eyed Wayan. 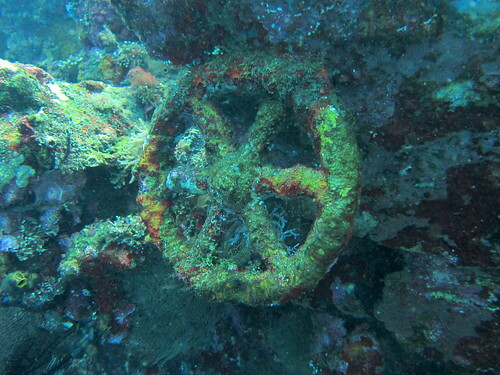 The wreck itself is fairly broken up, so it’s impossible to have an idea of its size just from one picture. Here’s part of the inside where a portion of its hull came to rest tilted on its side. 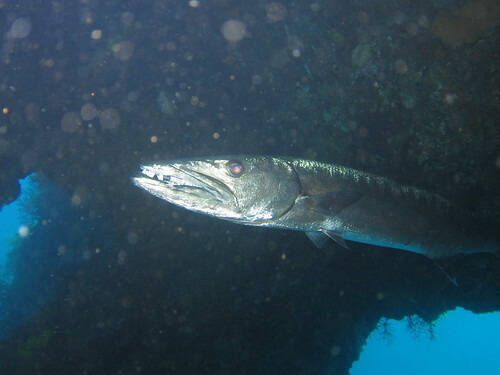 It’s not often that we come up close to the resident great barracuda. My last trip, I only caught a glimpse of him once and it was the same this time round. 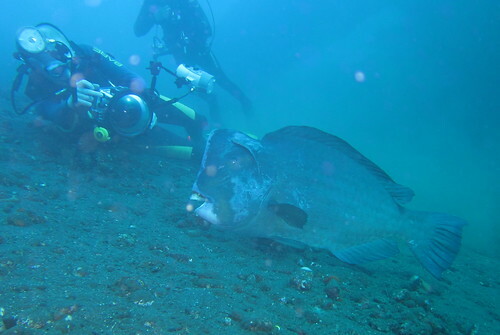 A group of us practically came nose to nose with him in one of the chambers of the wreck. You can just about make out its ferocious teeth. Pardon the poor picture quality, I was still testing the camera. 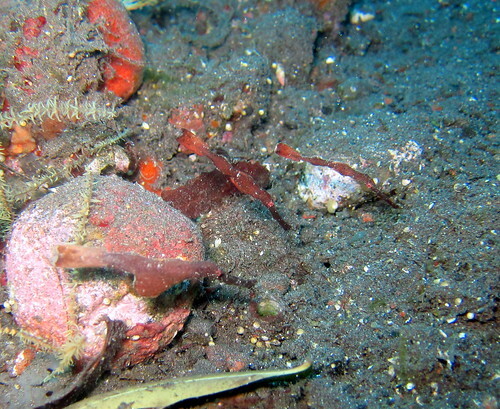 Other visible bits of the wreck included a boiler valve encrusted with coral, and I tried to get some pictures of me trying to turn the valve, but in vain. 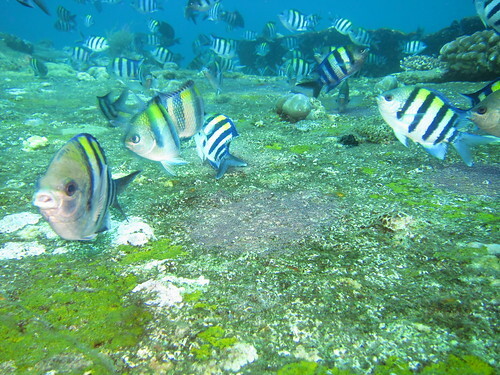 Residents of the wreck included plenty of bumphead parrotfish. When we went in September, it seemed like the season. 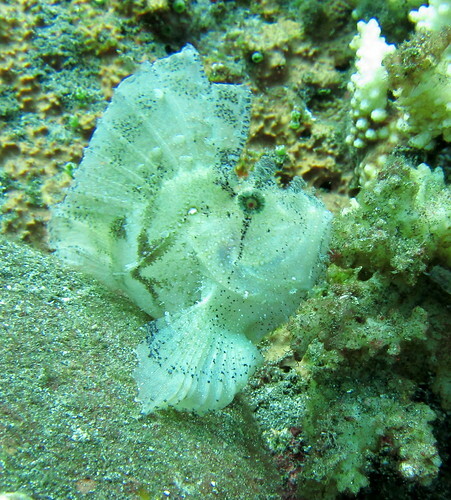 We saw them on a lot of dives at the wreck and not just in the early morning. This one in particular was easy to approach as it rested on the bottom. It didn’t seem fazed by the big SLR at all. 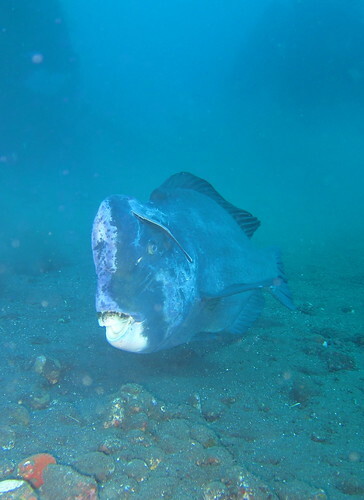 This poor fella was probably sick and in need of some serious cleaning from the blue-streak wrasse here, hence not quite caring whether anyone took its photo. 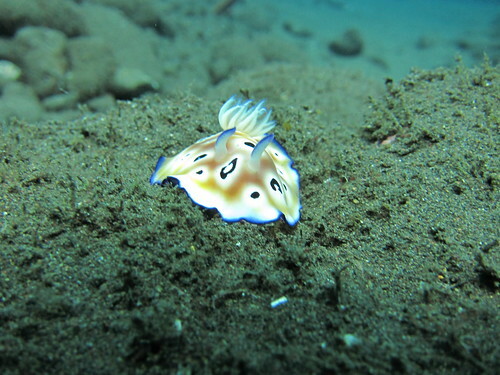 We caught some other less-sick fish being cleaned, like this blue-spotted stingray bulging out from the bottom in its characteristic way, signalling that it was open for cleaning. 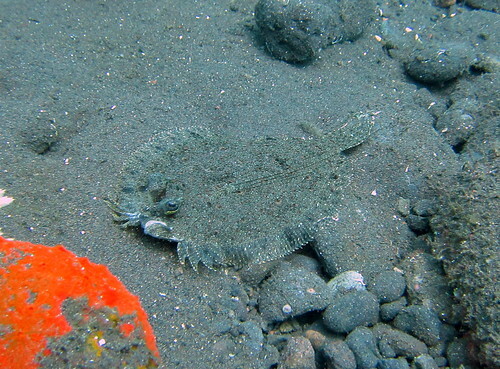 Tulamben’s black sand gave cover to all sorts of strange fish, like this peacock flounder just about concealing itself. Only its bulbous pair of eyes gives the game away, thereafter its shape becomes apparent. 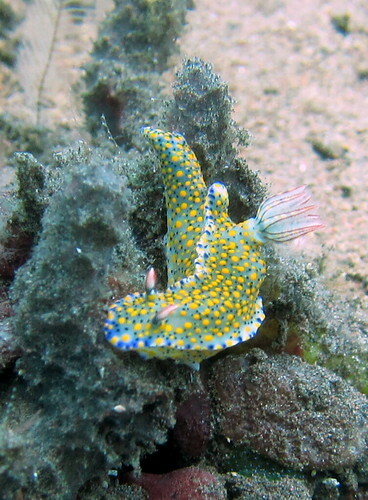 Similarly given away by its bulging eyes was this dragonet. 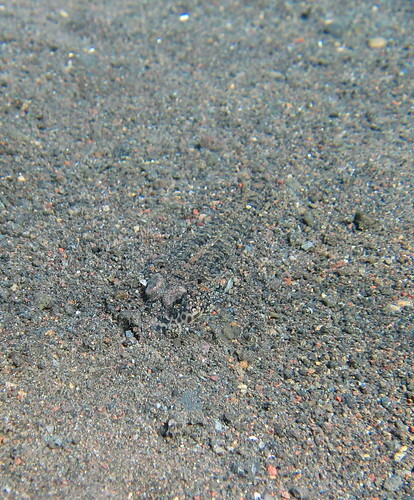 It reared up as I got closer, but not close enough to see exactly what type of dragonet it was. 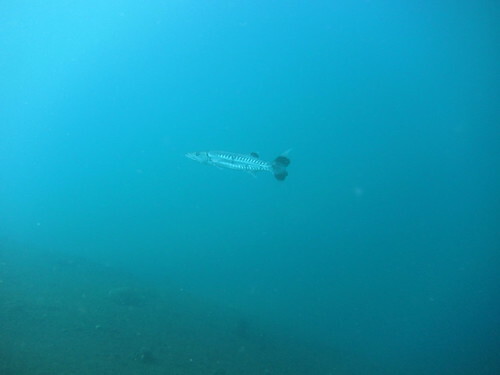 Beyond the wreck, there were other things to see, just not that often, like this blackfin barracuda. 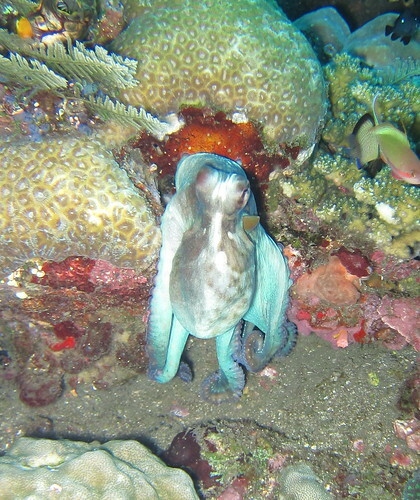 There was also the occasional squid, seen from afar. 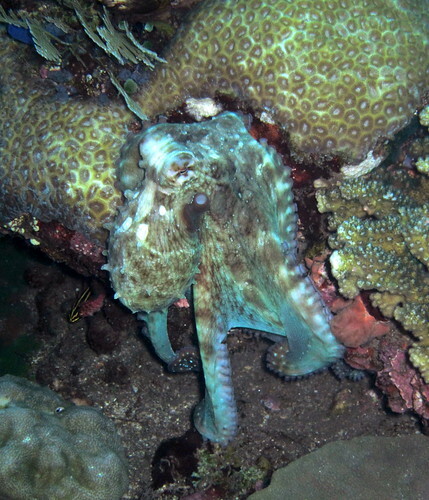 Squid tend to be very shy and it’s not easy to get a shot of one especially in the day time. But the most exciting thing about the blue was the occasional treat of fish schooling above the wreck, like these jacks starting to form a tornado. 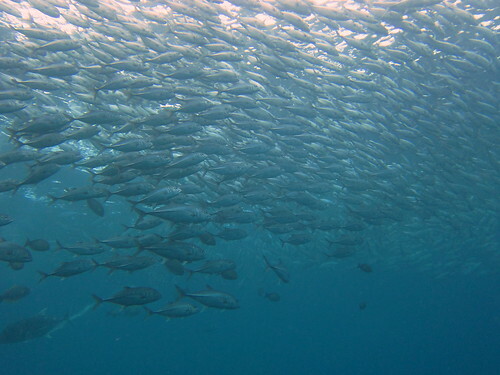 It’s quite exciting when you see a bunch of them forming up, I always wonder exactly how many fish end up inside that tornado. It’s such an amazing thing watching them congregate and almost block out the light. 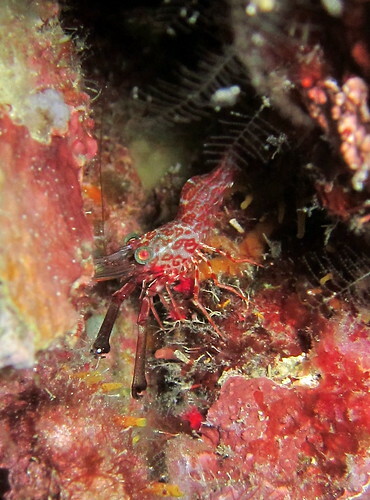 Our night dive was where I finally figured out how my strobe and camera worked together and I very merrily went round taking a tonne of photos. Sadly, not a great deal of them turned out well as I didn’t have the chance to linger. 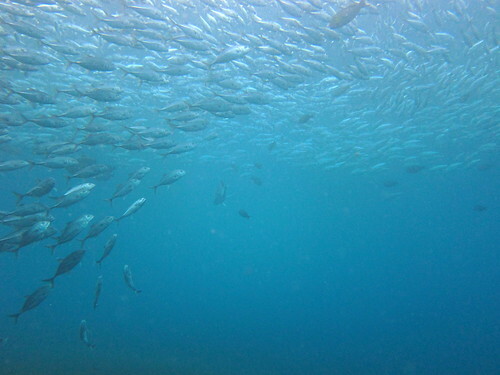 We had a big group with us and it was tough to stay in one spot undisturbed by other divers for a while. 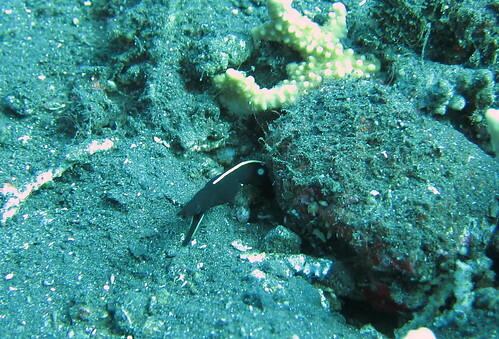 We revisited the black-finned snake eel from the last time, but didn’t manage to get in a better shot. 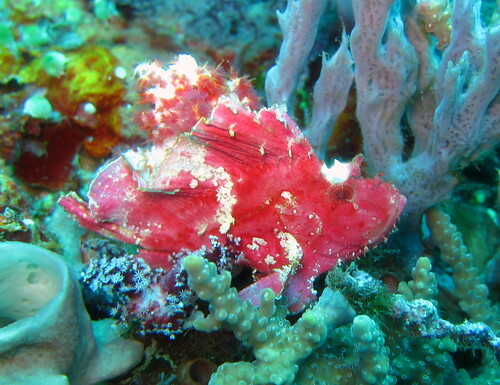 There was a pretty little juvenile raggy scorpionfish, not quite so well camouflaged amongst the coral. I spotted it easily from its eyes – they look so much like Starlight mint sweets. 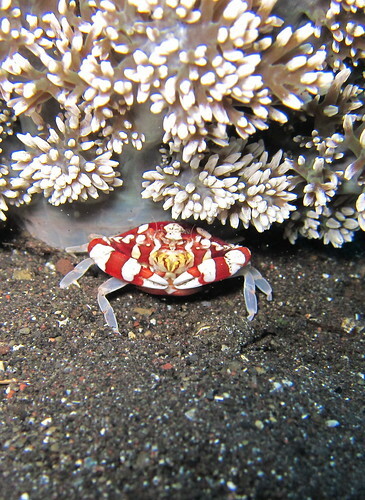 Next up were the crustaceans that tend to only come out at night. 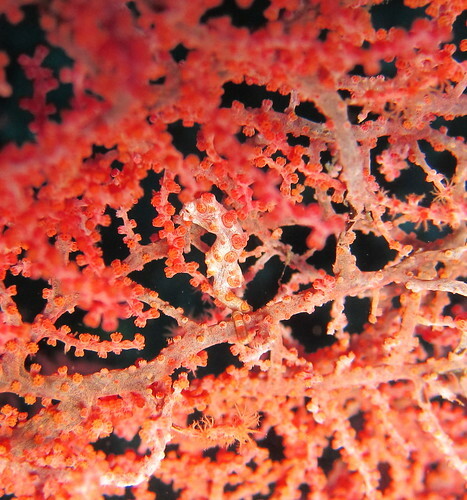 Can you spot the transparent shrimp here? 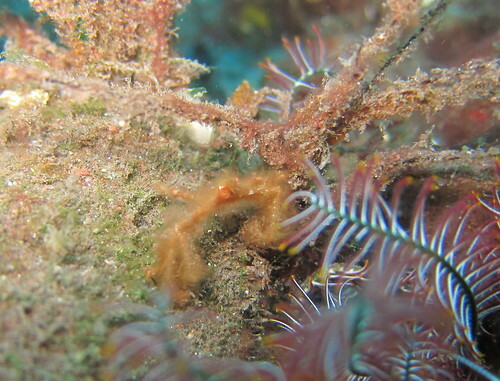 Then there was this uncooperative coral crab saying “look Ma, no hands!” It refused to come out and show itself topside up. 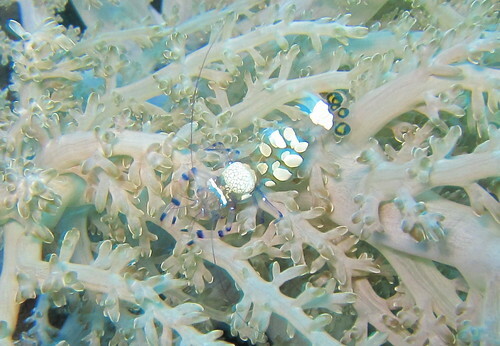 And finally, after much frustrated snapping, I have a picture of a very shy saron shrimp. Isn’t it beautiful? 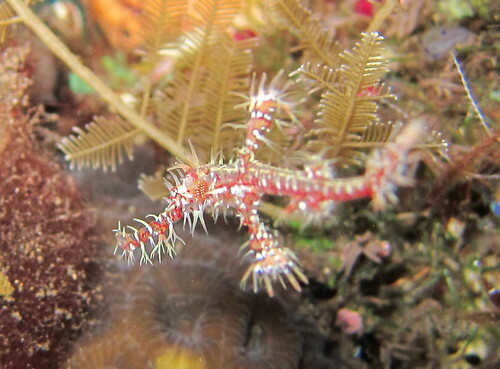 For a dive trip to a place full of coral bleaching, and with general low visibility, this trip to Redang was pretty fruitful!